There is one type of shuttle implemented: the Light Fighter. It can be sent to attack an enemy ship. After it has completed its attack, it will turn around and make its way back to your ship. Your ship can store a number of shuttles equal to the number of shuttle bay systems placed on it. When saving and loading the world, your ship will save any shuttles currently stowed in the shuttle bay. Any of your shuttles that are deployed in the world will remember that they belong to your ship, so they can be reclaimed later. If a shuttle runs out of fuel, it will be unable to move, and can only be reclaimed by ending your turn with your ship within one tile of it. You may only leave your current sector if all of your shuttled are stowed aboard your ship. Shuttles will check to make sure you have enough crew before launching. There is no GUI yet for viewing and launching shuttles. Right now, this is done with debug commands. The shuttle shop is still non-functional. 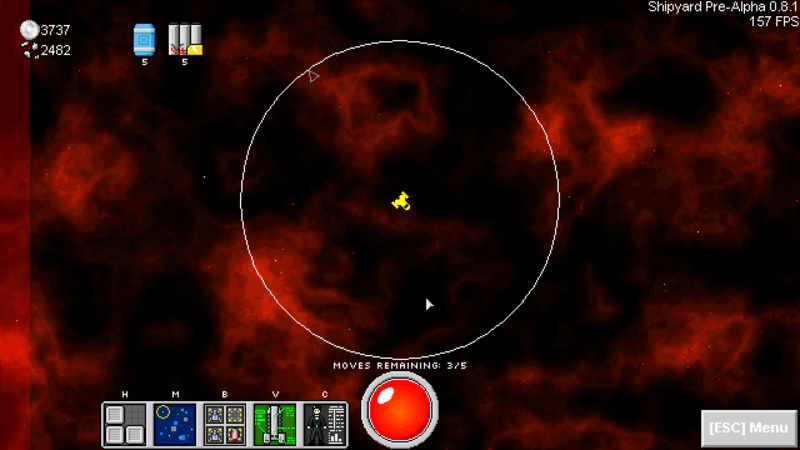 Giving shuttles to the player is also done with a debug command. There is only one type of shuttle (the Light Fighter described above). I plan to have at least two more by the time the update is released. The Light Fighter defaults to attacking the target ship’s bridge. There is no way to target another system at the moment. Enemies cannot use shuttles, and even if they could, shuttle-to-shuttle combat is not implemented. Ship-to-shuttle combat (that is, a full-size ship attacking an adjacent shuttle) is also not implemented. In the top left, just to the right of your credits and scrap, is a list of your currently active consumables and the number of turns remaining on each one. On the bottom left is a hotbar, which replaces the giant, chunky buttons of the current version. From left to right, the icons are: Cargo Hold, Sector Map, Shuttle Bay, View Ship, and View Character. In the bottom center is a hitpoint gauge. Since ships are destroyed at 40% of their maximum HP, the gauge will show “zero” at 40%. I believe I’ve already shown this, but in case you missed it, the ring in the middle of the screen is your “scanner”. Objects that are within your scanner range will appear as color-coded arrows around the edge of the ring. In the new version, the scanner range stat is provided by your ship’s bridge, meaning there is now a reason to allocate crew and power to it. For those of you like me whose brain goes crazy at the lack of symmetry with the hotbar only on the left of the HP gauge, don’t worry: I’m planning to have a second hotbar to which you can bind consumables and shuttles for quick use.